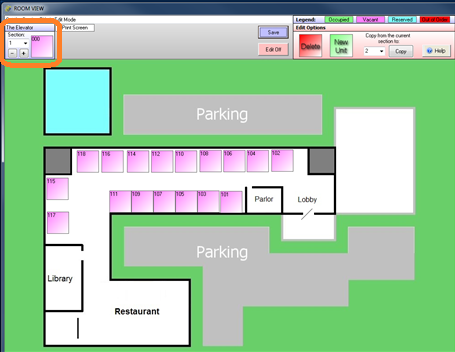 Graphical Room View displays an approximate layout of the property and shows where each room is located within the property. Separate sections can be set up for different locations, floors, etc. Camp sites and boat slips can be set up as well. Color coding reveals clean/dirty status and which rooms are vacant, reserved, occupied, and out of order. Graphical Room View setup is not difficult but should be performed by someone with a working knowledge of image editing. You don't need special software; you can edit the images in Paint®. Once it is set up you don't need to edit it again until your property is changed or you add new locations. Please read this entire document before you begin. You can have up to 99 sections. Each section should be 1 or 2 digits such as 1 or 01. This will be part of the file name. Each section will be in a separate *.JPG file called GARMVIEW*.JPG. The * must be replaced with a numeral. Example: GARMVIEW1.JPG or GARMVIEW10.JPG; do not use an alpha character. For example, GARMVIEWB.JPG will not work. This document will take you through each step. Step 1: Set up the room numbers in Rooms Setup. Step 2: Create the graphic templates. Step 3: Create the section records. Step 4: Copy section records. Step 5: Move the templates. Step 6: Assign rooms to each section. Step 7: Display the completed sections. Step 1: Set up the room numbers. Room numbers must be set up first. If you have not entered your room numbers into Execu/Suite, go to Manager/Setup > Hotel Control Files Setup. Then select Rooms and Room Types . Valid room numbers must exit to attach to the graphic and each room number must have a valid room type. Step 2: Create the templates. Go to your Execu/tech Hotel folder. Find GARMVIEW1.JPG, GARMVIEW2.JPG, and GARMVIEW10.JPG. Move or copy them to another folder. Also make copies of each for a backup that you will not edit. In the folder to which you moved or copied the files, open GARMVIEW1.JPG in Paint or create a new template. You might find editing an existing image easier than creating a new one. At the top of the template is a clearly marked area that you should not edit. This section will be covered by the toolbar on the user's screen when displaying the Graphical Room View. If you use your own template you should save approximately 100 pixels at the top to be covered by the toolbar. Create a map or layout of the section. The depth (vertical length, top to bottom) should be 700 px or less so that it will display fully on the screen, depending on your screen resolution in Windows. Save the graphic and continue with the next section. Remember, Section 1 will belong to graphic GARMVIEW1.JPG, Section 2 will belong to graphic GARMVIEW10.JPG. You will not add the rooms to the layout; this is done later from within Execu/Suite. - This step creates the Section Record only. You do not create the individual rooms yet. Don't worry about that the screens look at this point. Log onto Execu/Suite. Go to Manager/Setup > Hotel Control Files Setup > Graphical Room View. When the display opens, go to the "Section" drop-down at the top left and select 1. Then delete all but one of the rooms by dragging them into the Delete box as shown below. Remember to save one room. You will delete it later. When you have deleted all but one of the rooms, click the Save button and exit by clicking the X at the top right. Answer Yes to save the record. Now that you have created a section record, you can use the "Copy" function to create the additional sections. Again, don't worry about what the screen looks like. From the top left drop-down, Select the section you just created. 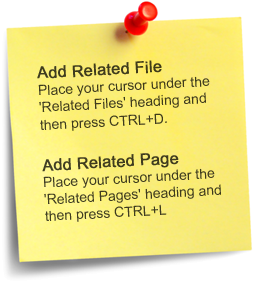 Then select the section to copy TO by clicking the Copy button. Remember, each section must match the number in your *GARMVIEW**.JPG file. For example, Section 2 will match up with GARMVIEW2.JPG. Step 5: Move the edited templates. After the section records have been created, copy or move the GARMVIEW**.JPG files back into the Execu/Tech folder IF you remembered to make a backup of the files BEFORE you edited them. Answer yes to replace the original files IF the backup exists. It is important to keep the original files in case you have to start over or in case something happened to the formatting. Now in your Execu/Tech hotel folder you should have files for each section, GARMVIEW**.JPG such as GARMVIEW1.JPG or GARMVIEW10.JPG. You should have a section record within the Graphical Room View for each section. You should have room numbers for each room in the ROOMS setup. - This step consists of several tasks. Go to Manager/Setup > Hotel Control Files Setup > Graphical Room View. At the top left, select the section to edit from the drop-down. Click "New Unit" and drag it into the map. It will create a pink square representing the new room. 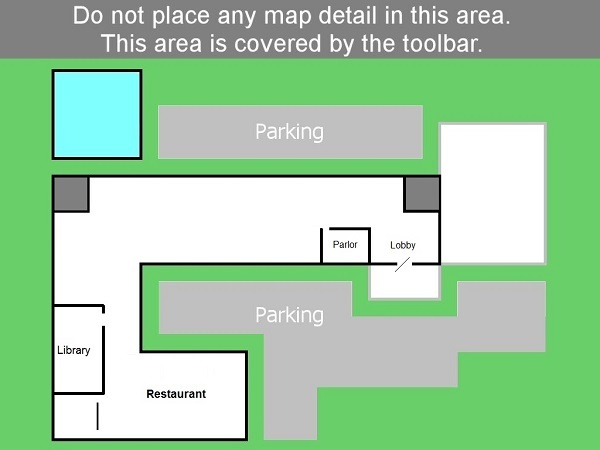 Drag the room to its location on the map. Continue with each room. When finished, click the Save button. Edit each section in the same way. Step 7. Display the completed sections. To see your new Graphical Room View images, click the "Room View" icon on your Execu/Suite screen or go to Front Desk Menu > Front Desk Operations. 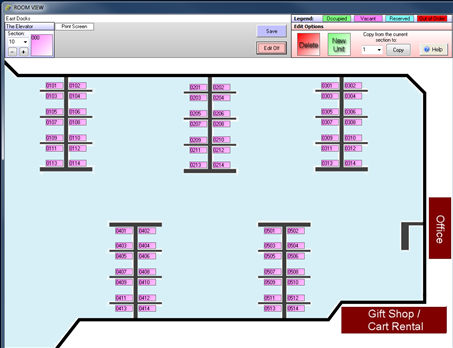 Select "Display Graphical Room View". When the display opens you can select the section at the top left. To edit the image, go back to the appropriate step in this guide.